About: Claire Takata has never known much about her father, who passed away when she was a little girl. But on the anniversary of his death, not long before her seventeenth birthday, she finds a mysterious letter from her deceased father, addressed to her stepfather. Claire never even knew that they had met. Anesa A’s (Murphy MS Student) Thoughts: I have to admit I was pleasantly surprised with this book! By reading the summary, I assumed this would be another one of those “lame mysteries.” This mystery started off really slow however it became an engrossing read at the end. Claire has to try to figure out what happened in her biological father’s past that could still be influencing her life now, 10 years after his death. She, along with her brothers and their friends, look into her family and step-dad’s lives as things begin to get tense since someone, or multiple someones, is out to get Claire. 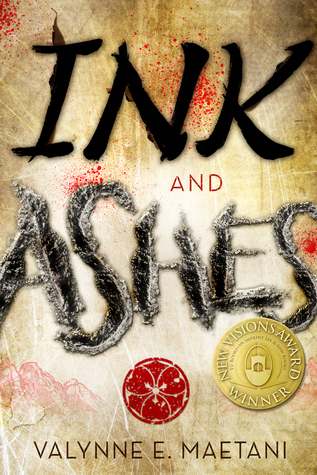 I loved the Japanese-American culture portrayed in Ink and Ashes. It was fun to see all the Japanese expressions throughout the story too. The story, itself, was fun and very suspenseful. I would rate this book an 8/10. Nitya L’s (MMS Student) Thoughts: Claire never really knew her father that well, since he’d died when she was little. She’d always assumed her mother met Claire’s stepdad after her father’s death. Until one day, on her father’s death anniversary, Claire discovers a letter from her father addressed to her stepfather. She does more research and investigation, and finds out that her father was part of the yakuza, which was basically a “Japanese mafia.” If that weren’t enough, a mysterious person sends threat messages to her in different ways. What’s going on, and what have her parents been hiding from her? I could NOT put this book down once I started it. I was so relieved that the mystery wasn’t just creeping in slowly (which would have stretched the book and made the beginning redundant and tedious). Instead, you could feel the suspense from the very first chapter. Honestly, I told myself that I would read it for 10 minutes and then do my homework (which I had quite a lot of), but regardless I ended up reading it for an hour. Yay me. Anyways, that’s how hooked I was. The first few chapters were a bit confusing since it went kind of fast, and there were some parts in the book that were a little too quick and perplexing (also, all those names were difficult to keep track of!). But the plot was really unique and a nice twist on mystery. There were so many turning points and plot twists that blew my mind. I really like how the author incorporated Japanese culture into it. I really liked the main character, Claire, and although she sometimes acted like a stereotypical tomboy (trying to act WAY too tough, etc.) it was better than having a weak character. She really seemed (almost) realistic (besides the tough guy act I just mentioned) and I enjoyed listening to the story from her point of view. I would totally give this book an 11/10 for its AMAZING plot and how suspenseful it was, and this should REALLY be on the Lone Star list. If there were a sequel to come out, I would definitely try to get my hands on it. Emily H’s (MMS Student) Thoughts: I was attracted to this book because of the mystery/thriller and being centered around the yakuza and Japanese culture. The story was intriguing with the friendship and sibling love and best friends turned into lovers. At some times I wanted to chuck the book across my room for how stupid Claire was acting but it was a real page-turner. The author provided many potential suspects that kept me second guessing myself and the plot twists were surprising. The way the author described the characters and their roles in the story made it easy to get attached to them like Fed and Claire’s step-father. Most parts of the book were easily predictable and I didn’t like how long it took the story to get dangerous but overall i give it a 7 out of 10. Audrey’s Thoughts (SPL Teen Librarian): I started reading this book on a whim one evening…. and could not put it down! Ink & Ashes is a solid mystery/thriller that kept be guessing up until the end. The mystery elements really helped to propel the narrative, as well as the characters. The characters, and particularly the teens, seemed very genuine to me. I loved how Claire thought on her toes and would put clues and evidence together by critically analysis versus ‘insta’ knowledge, or far out plot holes in deus ex machina fashion. Also, when was the last time you read a book that pertained to the Japanese Mafia?!? I think this is a solid read and one of my favs on the list thus far. Unfortunately, the cover isn’t the most appealing and provides little info about the book, hence the reasoning why it took so long for me to get in to it. Lesson learned, don’t judge a book by it’s cover and give this one a try! This entry was posted in multicultural, Murphy Middle School, mystery, Suspense, TX Lone Star List 2016 Nominee and tagged Ink and Ashes, Multicultural, Murphy Middle School, mystery, TX Lone Star List Nominee 2016, Valynne E. Maetani. Bookmark the permalink.